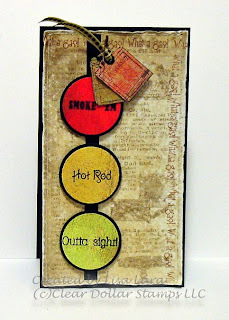 This is my card I made today using the new releases COOL RIDE and GAS CAN from CLEAR DOLLAR STAMPS. My inspiration came from PaperCrafts magazine Jan/Feb 09 issue page 39. I just love this stop light. 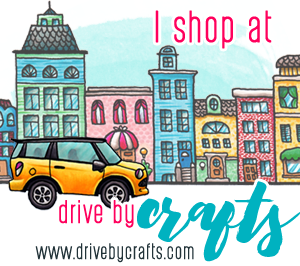 WHAT I DID: My card is 3 1/4 x 5 3/4 (skinny card). I punched out the colored circles from 1 1/4 punch and the black circle that mats it is 1 3/8 from SU. The colored circles are popped up as well as the black circles. The black strip behind is 1/4" wide and slightly smaller than the inside panel which is 1/8" smaller than the card. I stamped "What a Gas" sentiment around the top and right edge only of the vintage paper. Than sanded it with sand paper. I then sewed around the edges with sewing machine and adhered to the black card. Then I ran my finger around the edges pulling up the unsewn outside edges. The black strip is adhered, then the circles. I then stamped two gas cans trying to get a faint look on the BG DP. I cut each out, added an eyelet, put ribbon through and safety pin then adhered with three pop up dots in heighth to be slightly higher than the stoplights. That's it. Pretty simple. What a fun and creative card Lisa!! WOW love this! Oh Lisa -- I love this card. I would have never thought to create a stoplight. The paper really gives it a vintage feel. Lisa, what a great card! 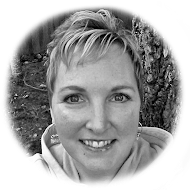 I love your theme, layout, and idea... definitely a candidate for a good case! You are a genius, Lisa....how cool to make a stop light for the Cool Ride sentiments and the gas can is the perfect detail....LOVE it!!!! Oh my gosh Lisa this is so cool. I really like the pape ryou used. It is super. I am ready for some stamping with our new goodies. I won't be able to start until next week..Can't wait..Hugs.